One of the biggest cities in the state of New Mexico, Santa Fe is also the state capital. The city is located in Santa Fe County in the central part of New Mexico and is nicknamed 'The City Different'. Santa Fe has a population of over 80,000 people, making it the fourth most populous city in the state, and covers an area of 37.4 square miles. Santa Fe was used as a home by various indigenous peoples over a period of several thousand years, with these peoples building little villages in the area that would later go on to become the city of Santa Fe. The city itself was officially founded in 1610 by Spanish settlers and its name translates to 'holy faith' in English. Due to the fact that it was founded such a long time ago, Santa Fe is technically the oldest state capital in the United States. The city was first part of New Spain, then later became part of Mexico, before eventually becoming part of the United States after the Mexican-American way of 1846-1848. 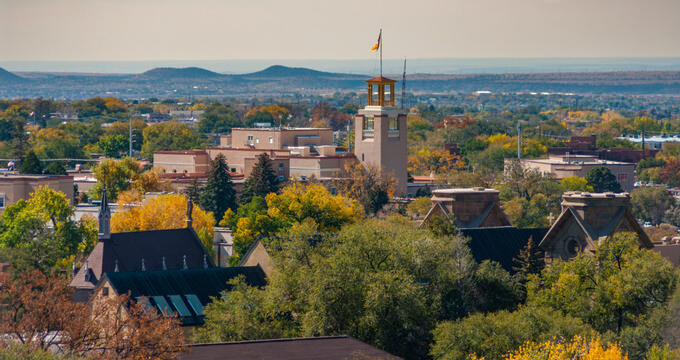 In 1912, New Mexico became an official state, and the 20th century saw great changes and developments in the region in order to elevate the status of the city and attract more businesses and residents. It was during this time that the "City Different" nickname started to come about, as Santa Fe began to be seen as a prime place for freedom of expression. With a welcoming attitude, friendly people, and a culture that encourages people to be themselves, the city stands out from many other locations around the United States and the world. Many of the homes and buildings in the area are Mexican-style, due to the history of this location. The elevation of a town or city tells us how high it is above sea level. Santa Fe has a relatively high elevation of 7,199 feet (2,194 m). When compared to many other major cities around the United States and the rest of the world, the elevation of Santa Fe is much higher. Many people live in coastal locations, which tend to have an elevation of 500 feet (152 m) or less. The elevation of Santa Fe is so high that visitors to the area may need some time to adjust to the city’s conditions. The air gets thinner at higher altitudes and the temperatures get colder too, with various other side effects. The highest point in all of New Mexico is Wheeler Peak, which has an elevation of 13,167 feet (4013.3 m) and can be found northeast of Taos. The state's lowest point is the Red Bluff Reservoir, situated on the Texas-New Mexico border, which has an elevation of 2,844 feet (867 m). Other major cities around New Mexico include Albuquerque, which has an elevation of 5312 feet (1619 m) and Las Cruces, which has an elevation of 3,900 feet (1,200 m). Santa Fe has a dry steppe climate due to its location, meaning it has hot summers and quite cold winters, with generally dry conditions and low amounts of rainfall throughout the year. The temperatures in Santa Fe can change quite suddenly as the sun sets and rises, with the days generally being quite warm and the nights dropping down to much colder temperatures. Snowfall can occur in this region, with several inches expected through winter, but rain only really falls in any large quantities during the summer months, which is the North American Monsoon season. Modern day Santa Fe attracts many visitors with a strong range of museums, attractions, historic sites, live shows, and recreational activities nearby. Tourism is a big part of Santa Fe's economy, so there are plenty of activities and attractions to enjoy. The Plaza area in Downtown Santa Fe is a popular gathering point for tourists, and various fiestas and annual events are held here at various times of the year.